Sample Length: Shows the original length of the sample in sample data points, and the new length which you can enter in its field. Time Length: Shows the original length of the sample in milliseconds (when played at middle C), and the editable length. Tempo Settings: You can fit the sample to play within a certain number of rows. For this, the target ticks per row (speed) and tempo must be known. By default, the current tempo settings are used, but they can be overriden here. The exact meaning of the speed and tempo values depends is determined by the song’s Tempo Mode. 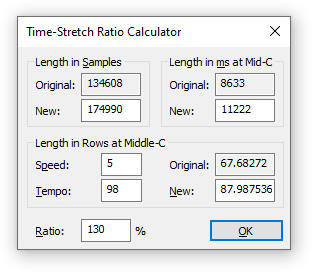 Playback Length: Shows the original length of the sample in rows (based on the Speed and Tempo settings), and the new length which you can enter in its field. Ratio: Shows the amount of lengthening in percent that will occur based on the given data above. This is updated when you change any of the previous settings, or you can enter a general percentage. This page was last edited on 20 June 2017, at 14:18.